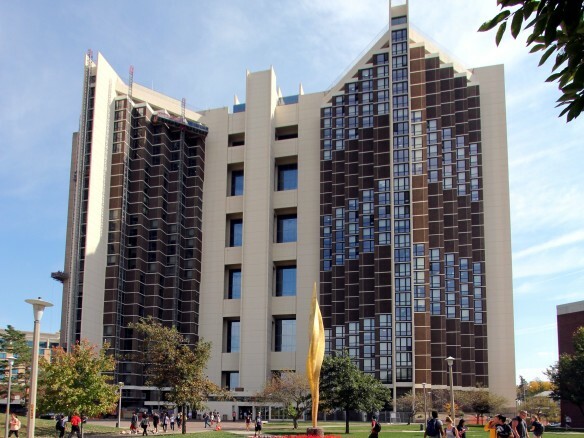 Home to 2,200 Illinois State University students during the academic year, Watterson Towers is the tallest residence hall in the United States. Watterson is designed in room clusters, or "suites", as an alternative to traditional linear corridor-style residence hall. The 28-story twin-tower complex is divided into ten, five-story "houses" that are named after U.S. Secretaries of State. The unique design of Watterson Towers treats each house as a separate residence hall, with the third floor of each house containing elevator access and an enclosed walkway that leads to the opposing tower. Jennifer Villena-Johnson, project architect for Cordogan, Clark & Associates, notes that "the upgrades to the house elevator lobbies and suites have provided students with a sense of community and belonging to their particular house within this large residential hall". Within a house, most floors are divided into four "suites" consisting of six rooms each. The towers are currently undergoing interior and exterior renovations designed by Cordogan Clark & Associates. "In general, we’ll be aiming for a less institutional feel," said Maureen Blair, ISU housing director. While the floor plans won’t change, there are significant infrastructure and aesthetic improvements for the residents. Aesthetic improvements include new furniture, renovated bathrooms, new bedroom lighting, new floor finishes and renovated lobbies. Infrastructure improvements to the building include expansion of the sprinkler system, exterior repairs, new windows, installation of wireless technology, insulation upgrades in the breezeways and upgraded mechanical and fire alarm systems. The renovations are being coordinated over a 30-month period to allow for continuous occupancy. "This will be the only building renovated while occupied," said Blair. Since last fall, a section of 10-floors per phase has been taken offline, and construction crews are co-existing with the residents at Watterson. Students see scaffolding outside their windows, and contractors are sharing elevators and staircases with residents. "It’s required a lot of planning and coordination," said Blair, but fine-tuned plans should keep everything running smoothly. The floors that have been renovated to date have been well-received by the students. "The university has had great feedback from the students. They are thrilled with the new lobbies, the bright new bathrooms and the new finishes and furniture in the suites," says Villena-Johnson. All renovations are expected to be completed by 2012.